I weave every piece by hand. It's a slow process. I usually weave five to six pieces per project to spread the set-up time across several items. Setting up the loom takes several days. Once I have finished all preparations on and off the loom, it takes between one and three days to complete a throw measuring approximately 100cm x 180cm. My practice is based on environmental values. I often use unbleached and undyed linen in my warps. My choice of weft yarns is limited to naturally eco-friendly yarns like linen, hemp, undyed or plant-dyed wools and undyed alpaca from the UK. If I use any other types of yarn, like cotton, it comes in the form of a second-hand or recycled yarn. For colour I use plant-dyed wool by a natural dyer from Finland, second-hand yarns or recycled yarns from a UK company who process industrial surplus into new yarns. 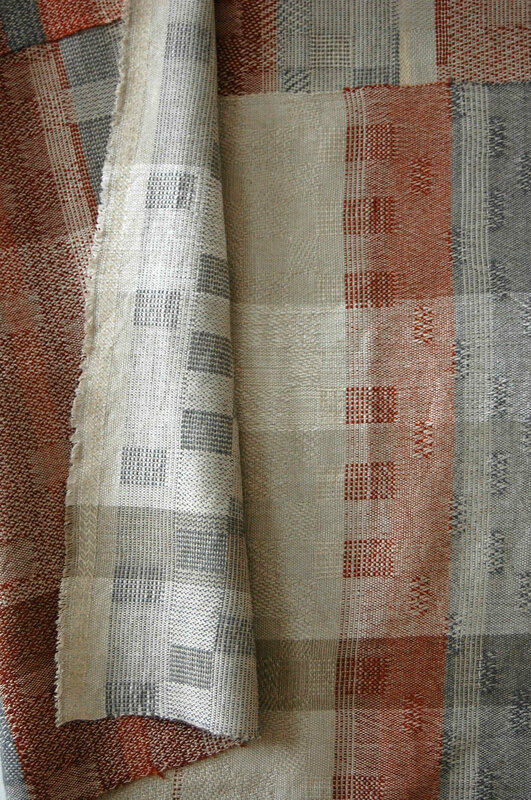 Another way of introducing colour is by recycling "waste warps" from fellow weavers. At the end of a weave project, when weavers cut off their work, the final bit of warp on the loom goes to waste. It consists of hundreds of individual lengths of yarn. I collect and knot them together so that I can weave with them in the weft. During weaving the little knots become visible randomly across the cloth, and the small yarn ends stick out. Visually, this reminds me of the hand-made character of many tribal textiles from around the world. In places where hand-spun and other materials are valuable, every bit is put to use. So even the shortest cut-offs and left-overs are made into tassels and similar decorations. Such textile pieces as well as the philosophy behind their making have always had a strong appeal to me.